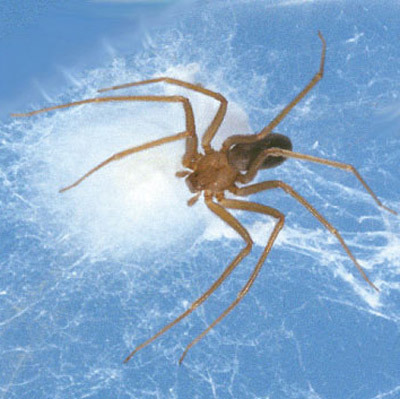 The brown recluse spider, Loxosceles reclusa Gertsch & Mulaik, is frequently reported in Florida as a cause of necrotic lesions in humans. For example, in the year 2000 alone, Loft (2001) reported that the Florida Poison Control Network had recorded nearly 300 alleged cases of brown recluse bites in the state; a subset of 95 of these bites was reported in the 21 counties (essentially central Florida) under the jurisdiction of the regional poison control center in Tampa. Figure 1. Female brown recluse spider, Loxosceles reclusa Gertsch & Mulaik. Photograph by Jeffrey Lotz, DPI. I called the Florida Poison Control Network to confirm these numbers, and was cited 182 total cases and 96 in the Tampa region. The actual numbers are less important than the fact that a significant number of unconfirmed brown recluse spider bites are reported in the state every year. 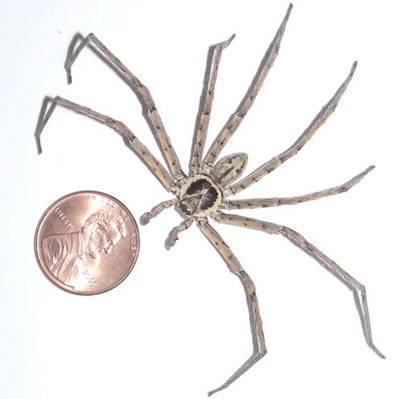 Yet not one specimen of brown recluse spider has ever been collected in Tampa, and the only records of Loxosceles species in the entire region are from Orlando and vicinity. A general review of the brown recluse, along with a critical examination of the known distribution of brown recluse and related spiders in Florida, seems in order at this time. Loxosceles reclusa was described by Gertsch and Mulaik (1940) from Texas. At the time of the first revision of the genus Loxosceles in the Americas (Gertsch 1958), the known distribution ranged from Central Texas to southern Kansas, east through middle Missouri to western Tennessee and northern Alabama, and south to southern Mississippi. Gorham (1968) added Illinois, Kentucky and northern Georgia. Later, he added Nebraska, Iowa, Indiana and Ohio, with scattered introductions in other states, including Florida; his map indicated a record in the vicinity of Tallahassee (Gorham 1970). Weems and Whitcomb (1975) noted that, "on many occasions specimens have been inadvertently brought into Florida in trucks and automobiles, hidden in luggage, boxes, and various commercial cargoes, but to date it appears to have been unsuccessful in establishing breeding populations in Florida." It is unfortunate that they did not document these alleged records, as this comment is not completely in accord with the following reference. An updated revision of the genus by Gertsch and Ennik (1983) reported a few records from Arizona, California, Colorado, Florida, Maine, Minnesota, New Jersey, New Mexico, New York, North Carolina, Wyoming and Tamaulipas (Mexico) [the reported Ontario (Canada) record in this publication subsequently proved to be a specimen of Loxosceles rufescens (Dufour); R. Vetter, personal communication, 2001]. Most of these peripheral records were interceptions of one or two specimens, not evidence of established populations. The Florida records consisted of two specimens, one each from Alachua (collected 10 January 1969) and Jefferson (Monticello, collected 21 August 1968) counties, and both were taken from inside automobiles. Subsequently, a sailor was bitten on the hand by a male brown recluse in the cargo hold of a naval ship in Jacksonville, in March 1986. This ship had just arrived from North Carolina, where it had loaded supplies. To date, this appears to be the only verified case (the actual causative agent of a bite captured and identified) of brown recluse spider bite in Florida [due to complicating factors, medical personnel familiar with this case even questioned the veracity of this one alleged bite]. Within the last two years, single buildings (in Callaway, Jacksonville and Tallahassee) have been found to contain populations of Loxosceles reclusa (Edwards 1999, 2000, 2001). There is reason to believe that all three of these records are the result of movement of infested materials from other states, so it is entirely possible that the infestations are restricted to these buildings and can be eliminated. Such was the case with an infestation of the similar Loxosceles rufescens found in Orange County (DPI records from Orlando: 28 January 1982, 4 January 1983 and 18 August 1986) in a single building; the spiders were subsequently eradicated. The only other records of Loxosceles rufescens occurring in Florida are a few juvenile spiders in buildings in nearby Osceola County (Runnymede; Banks 1904) and one juvenile specimen from Dade County (Lemon City; Gertsch 1958). This cosmopolitan species is probably native to the Mediterranean region, and is sometimes called the Mediterranean brown spider or Mediterranean recluse. It has been recorded from a number of localities across the U.S., particularly in larger cities, where it is transported by commerce (Gertsch and Ennik 1983). In summary, the verified records of brown recluse and related spiders in the state are limited to the following eight out of 67 Florida counties: Alachua, Bay (Callaway), Dade (Lemon City), Duval (Jacksonville), Jefferson (Monticello), Leon (Tallahassee), Orange (Orlando) and Osceola (Runnymede). The more northern counties (Alachua, Bay, Duval, Jefferson and Leon) were all isolated records of the native brown recluse, Loxosceles reclusa, whereas the more southern county records (Dade, Orange and Osceola) were of the introduced Mediterranean recluse, Loxosceles rufescens. The Alachua, Dade and Jefferson county records were interceptions of single specimens. The Bay, Duval, Leon, Orange and Osceola county records were infestations in one or two buildings. There is no evidence to support either the notion that a widespread population of brown recluse spiders exists in Florida or that there are numerous introductions of brown recluse into the state. Therefore, there is no reason to assume that frequent interactions between brown recluse and humans occur in Florida. 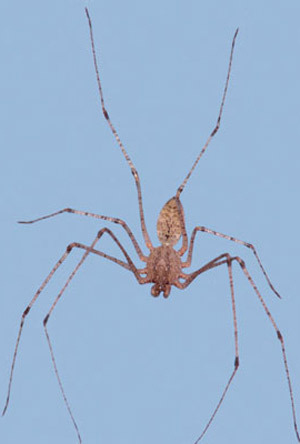 Subsequent to the original publication of this work (as a DPI Entomology Circular), Loxosceles rufescens was found in a warehouse in Escambia County, Florida; and Loxosceles laeta (Nicolet), the Chilean recluse spider, was found in a home in Polk County, Florida (Edwards 2002a). I have personally identified several hundred Florida spiders submitted for identification by the public, and only one specimen (the Bay County record) proved to be a brown recluse spider. In addition, I have seen thousands of Florida spiders submitted by professional biologists and inspectors, with only the few specimens mentioned above proving to be members of the genus Loxosceles. It appears obvious to me that the chance of interaction between brown recluse spiders and people in Florida is close to nil, agreeing with Vetter's (2000) assessment of reported brown recluse bites outside the natural range of the spider. Medical personnel should, therefore, consider a multitude of more likely causes (see below) before diagnosing and treating a necrotic wound as a brown recluse bite. The description is taken from Gertsch (1958). Adults of both sexes are similar in appearance and size, ranging from about 7 to 12 mm in body length. Adult females average slightly larger, about 9 mm compared to about 8 mm for adult males. The carapace is pale yellow to reddish brown, with a dusky brown patch just in front of the median groove (which is encompassed by a narrow, dark line); this patch is united to the front of the carapace by dusky brown stripes. In total, these markings appear in the form of a violin. In addition, three dusky patches may occur along the margin on each side. The sternum is yellowish, with other ventral body parts of the cephalothorax darker reddish brown. Figure 2. 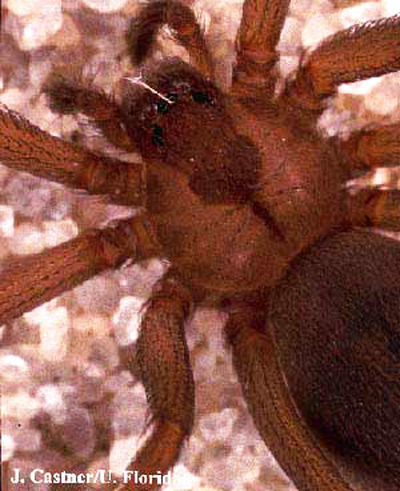 Detail of the carapace of the brown recluse spider, Loxosceles reclusa Gertsch and Mulaik, showing the dark fiddle-shaped marking often used to identify this spider. Photograph by James L. Castner, University of Florida. The legs are slender and dusky orange to dark reddish brown. They are numbered front to back with Roman numerals (I, II, III, IV). In females, the leg length formula, longest to shortest, is II, IV, I, III, typically with leg II being over 18 mm in length, and leg III about 15 mm, the other two pair intermediate in length. The male leg formula is II, I, IV, III, with leg II over 24 mm and leg III about 17 mm. The abdomen of both sexes is tan to brown, but it may appear darker if the spider has recently fed. Juveniles are paler in all respects, as are occasional adults. Figure 3. 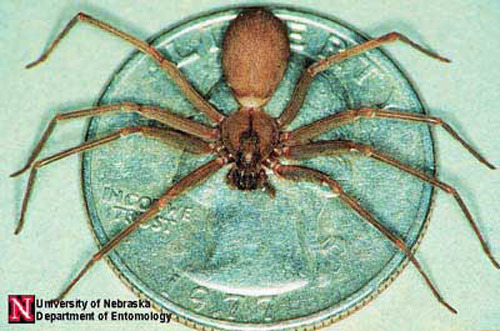 Adult brown recluse spider, Loxosceles reclusa Gertsch and Mulaik, showing leg length relative to a US quarter. Photograph by Jim Kalisch, University of Nebraska-Lincoln. 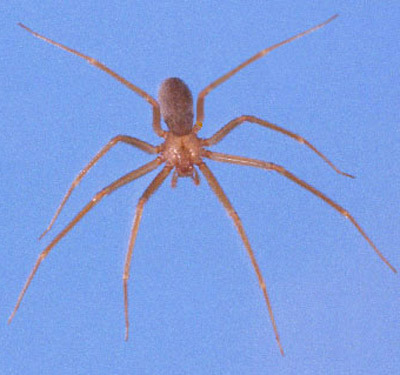 Males of the common southern house spider, Kukulcania (= Filistata) hibernalis (Hentz), are frequently confused with the brown recluse (Edwards 1983). The male palp length of Loxosceles reclusa is under 4 mm, considerably less than the superficially similar crevice spider. Another difference between the two species is that Loxosceles reclusa has six eyes composed of three isolated pairs (dyads), whereas Kukulcania hibernalis has eight eyes all clumped together in the middle front of the carapace. Figure 4. Male southern house spider, Kukulcania hibernalis (Hentz). Photograph by Jeffrey Lotz, Division of Plant Industry. Figure 5. The three pairs of eyes that help identify the brown recluse spider, Loxosceles reclusa Gertsch and Mulaik. Photograph by Jim Kalisch, University of Nebraska-Lincoln. 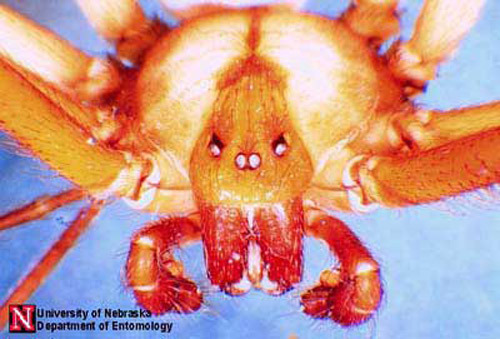 The only other Florida spiders with an eye arrangement similar to Loxosceles are the spitting spiders of the genus Scytodes, but these spiders have a domed carapace, lack a violin-shaped carapace marking, and are not known to cause serious wounds in humans. Occasionally, the huntsman spider, Heteropoda venatoria (Linnaeus), is misidentified as a brown recluse (Edwards 1979). However, the color pattern on the carapace of this species is reversed, with a light median mark on a dark background, and adults of this spider are much larger than a brown recluse. Figure 6. Female spitting spider, Scytodes sp. Photograph by G.B. Edwards, DPI. Figure 7. Adult male huntsman spider, Heteropoda venatoria (Linnaeus). Photograph by Marie Knight. Hite et al. (1966) made the earliest thorough report of the biology of Loxosceles reclusa. In their study, they recorded the habitat of 626 brown recluse in Arkansas found from May 1962 to December 1964. Most (430) were found in buildings and outbuildings, especially in boxes and among papers, in every room from basement to attic. They were found in almost any place which had remained undisturbed for lengthy periods of time, such as behind pictures, beneath or behind furniture, in boxes of toys, in clothing, among stored papers, in the corrugations of cardboard boxes, and in discarded articles, such as tires, inner tubes, and assorted other junk. Most of the specimens found in feral conditions were under rocks, especially in bluff outcrops, with a few under bark or in logs. They definitely seemed to prefer dry conditions. Spiderlings appear to stay with their mother for three to four instars before dispersing. They feed on prey provided by the mother during this time. Once dispersed, they may establish a home territory, where they stay through several more instars, as evidenced by the presence of several successive molts. Spiders go through a total of eight instars. Irregular webbing is seen in the nest area. Prey consists of a variety of other arthropods, including rather dangerous prey like other spiders and ants. The attack consists of a sudden lunge and bite, usually on an intended prey's appendage, after which the brown recluse immediately backs away (personal observation). The venom acts rapidly to paralyze the prey, preventing any retaliation for the initial attack of the recluse spider. After the prey is overcome by the venom, the brown recluse moves in to feed. Relatively harmless prey, particularly mobile prey like houseflies, will be held with the initial bite and not released. Most mating and reproduction occurs during June and July. Females were frequently found with more than one eggsac. In the laboratory, females made up to five eggsacs. Total eggs per female ranged from 31 to 300, total hatched young maximized at 158 for a single female; the largest number of young from one eggsac was 91; and percent emergence of young was 0 to 100. Some eggs were fed on by spiderlings from previous eggsacs still in the web, or even by the female (perhaps these were infertile). The egg stage averaged about 13 days, instars I-VIII 17, 110, 63, 41, 38, 34, 40, and 53 days respectively. Maximum age for a brown recluse from emergence to death was 894 days for a female, 796 for a male. A laboratory-kept specimen lived over six months without food or water. Captive specimens also proved moderately resistant to pesticides. These two characteristics illustrate why brown recluse populations may exist in buildings for long periods of time, despite repeated efforts to eradicate them. Figure 8. Female brown recluse spider, Loxosceles reclusa Gertsch & Mulaik, with eggsac. Photograph by Jeffrey Lotz, DPI. Brown recluse spiders usually bite only when they become trapped next to the victim's skin. Bites occur either when sleeping humans roll onto the spider or put on clothes into which the spider has crawled (Vetter and Visscher 1998). Typically bites occur under clothing, mostly on the thigh, upper arm, or lateral torso, less often on the neck (Anderson 1998) [Dr. Philip C. Anderson is a physician and medical researcher who has worked on brown recluse bites and venom for 40 years]. Description of the symptoms is from Wingo (1960), Gorham (1968, 1970), Anderson (1982, 1998), and Vetter and Visscher (1998). Reactions to a bite vary from no noteworthy symptoms to severe necrosis or systemic effects. Discomfort may be felt immediately after the bite, or several hours may pass before any local reaction to the bite occurs. In one study, only 57% of the patients realized they had been bitten at the time of the bite. It must be realized that there are at least two significant variables affecting the outcome of a bite. The first is the amount of venom injected by the spider. Like some venomous snakes, spiders are known to sometimes give "dry" bites, with little or no venom injected. The second variable is the sensitivity of the victim. Some people are simply more prone to have a severe reaction in instances where another person might only have a slight reaction. Typical symptoms are as follows: Symptoms start two to six hours after the bite. Blisters frequently appear at the bite site, accompanied by severe pain and pronounced swelling. A common expression is the formation of a reddish blister, surrounded by a bluish area, with a narrow whitish separation between the red and blue, giving a "bull's-eye" pattern. By 12 to 24 hours, it is usually apparent if a Loxosceles wound is going to become necrotic because it turns purple in color; if necrotic symptoms do not express by 48 to 96 hours, then they will not develop. If the skin turns purple, it will then turn black as cells die. Eventually the necrotic core falls away, leaving a deep pit that gradually fills with scar tissue. Experimental antivenin (Rees et al. 1981; not commercially available) was very successful when administered within 24 hours, but many times a victim does not seek treatment until after necrosis is well underway (more than 24 hours), after which the antivenin is less effective. Systemic effects usually take two to three days to show symptoms. Bites that become systemic usually do not also become necrotic; it is thought that in necrotic wounds the venom is localized in the tissue whereas in systemic reactions the venom is distributed quickly into the body without necrotic local effects. The wound is usually free of bacterial infection for the first two to three days but may be contaminated by patients due to pruritis (itching) leading to scratching. Recluse venom can exhibit extended necrosis in adipose (fatty) tissue of thighs, buttocks and abdomen of obese patients; there is also a gravitational flow of the venom effects, at times leading to satellite pockets of necrosis. Healing can take weeks to months and may leave an unsightly scar, although scarring is minimal in most cases. Skin grafts may be required to complete healing in the worst cases, but should be considered a last resort. The following technical analysis is condensed from the medical literature. Persons who suspect they have been victimized by a brown recluse spider bite are strongly encouraged to consult with a physician. In medical terms (Vetter 1998), bites from Loxosceles can be unremarkable (requiring no care), localized (requiring some care but usually healing without intervention), dermonecrotic (a slow- healing, necrotic ulcerated lesion needing supportive care), or systemic (vascular and renal damage, sometimes life-threatening). Within 10 minutes of venom injection, there is a constriction of capillaries around the site of the bite. A major venom component is sphingomyelinase D which causes hemolysis (destruction of red blood cells). Recluse venom has a strong disruptive effect on endothelial tissue. Polymorphonucleocytes (PMN) are activated (by the patient.s immune system) and infiltrate the bite site; in test animals where PMN activity was suppressed, degree of necrosis was lessened. General symptoms are edema (swelling), erythema (redness caused by blood being brought to the surface to counteract the damage), pruritis (itching), pain at the site, and mild fever. A pruritic or painful eruption can occur within a few hours of the bite and persist for a week, ending with scaling and peeling of the hands, and a truncal papular rash, that recalls pictures of scarlet fever rashes; the pruritis may be worse for the patient than the painful focal necrosis. The skin may feel hot and tender to the patient. It may be advisable to treat the rash and pruritis symptoms with Prednisone (Anderson 1998). Treatment with corticosteroids does not appear to affect either the skin necrosis or the hemolysis (Anderson 1998). Dermatologic expression varies. In mild self-healing wounds, the bite site may not progress past an edematous erythema; these wounds do not become necrotic and non-intrusive care is sufficient. In more serious wounds, a sinking blue-gray macule on the skin contains a "bull's- eye" pattern formation where a central erythematous bleb (blister) is separated from a peripheral cyanotic region by a white zone of induration (red-white-blue). If the bite becomes violaceous within the first few hours, this usually indicates that severe necrosis may occur and more supportive measures are necessary. The initial bleb gives way to ischemia (localized temporary blood deficiency). A central eschar (hardened scab similar to that made after burns) forms, hardens, and within seven to 14 days the eschar falls out leaving behind an ulcerated depression. The necrosis may continue to spread from the bite site possibly due to an autoimmune response (see above). Normally, the wound limits begin to recede after one week as healing begins. Unnecessary removal of tissue often leads to greater scarring than would result from normal healing. Extirpation of damaged skin is only recommended in severe cases and only after the limits of the wound are strongly demarcated at six to eight weeks. Most wounds self-heal with excellent results. Systemic conditions that might manifest in severe cases are hematoglobinuria (hemoglobin in the urine), hematoglobinemia (reduction of useful hemoglobin, resulting in anemia-like condition), thrombocytopenia (reduction of clotting platelets in the blood), and/or disseminated intravascular coagulation (DIC) (precipitation of platelets causing mini-clots all over the body). The presence of sustained coagulopathy with hemolysis indicates severe systemic loxoscelism. Fortunately, less than 1% of cases exhibit these symptoms. Although rare, if death occurs, it is most often from hemolysis, renal failure and DIC; children are most adversely affected due to their small body mass. Anderson (1998) noted, however, that none of the fatalities were proven to have been caused by a brown recluse spider. Unknown Causative Agents: periarteritis nodosa. Other possibilities include subcutaneous blisters and hives caused by stings of hymenopterous insects (ants, bees, yellowjackets, wasps), welts from urticating caterpillars, bites by predatory or parasitic bugs (assassin bugs, bed bugs), and other parasitic insect bites (black flies, mosquitoes, horse and deer flies, fleas). It is even possible that some as yet untested native spider is the cause of serious necrotic wounds. For example, circumstancial evidence in one case implicated Ctenus captiosus Gertsch (Edwards 1989), a wandering spider, as a cause of a necrotic bite, although a recent assay of the venom of this species did not find sphingomyelinase D (Dr. G. J. Bodner, personal communication, 2001). The expression of Lyme disease can give the classic 'bull's-eye' patterning characteristic of brown recluse bite. Although Lyme disease is rare in Florida, it does exist and would be a more probable diagnosis than brown recluse bite. Misdiagnosis in this case could be serious since Lyme disease can be treated and cured with common antibiotics. If diagnosed as 'brown recluse bite' instead, it will obviously be treated as such; the Lyme disease then may progress to serious symptoms of heart and central nervous system disorders, and can result in death. In treating alleged spider bite victims, a question that medical personnel should be asking is whether the patient has recently traveled outside the area where they live. They should also attempt to be aware of potentially embarrassing etiological agents such as filthy lifestyle habits (squalid conditions that might encourage vermin such as bed bugs) or unhygienic use of drug paraphernalia (Vetter 1998). Anderson (1982) made perhaps the most appropriate comment concerning spider bites, "In general, spiders attempt to avoid people. People should accommodate them." Dr. D. Sollee, Florida Poison Control Network, provided statistics on brown recluse bites in Florida. R. Vetter, University of California, Riverside, reviewed the manuscript and contributed valuable discussions about brown recluse distribution and bites. Anderson PC. 1982. Necrotizing spider bites. American Family Practitioner 26: 198-203. Anderson PC. 1998. Missouri brown recluse spider: a review and update. Missouri Medicine 95: 318-322. Banks N. 1904. The Arachnida of Florida. Proceedings, Academy of Natural Science, Philadelphia 56: 120-147. Dominquez TJ. 2004. It's not a spider bite, it's community-acquired methicillin-resistant Staphylococcus aureus. Journal of the American Board of Family Practice 17: 220-226. Edwards GB. 1979. The giant crab spider, Heteropoda venatoria (Linnaeus) (Araneae: Sparassidae). Florida Department of Agriculture and Consumer Services (FDACS), Division of Plant Industry, Entomology Circular 205 1-2. Edwards GB. 1983. The southern house spider, Filistata hibernalis Hentz (Araneae: Filistatidae). FDACS, Division of Plant Industry, Entomology Circular 255: 1-2. Edwards GB. 1989. The Florida false wolf spider, Ctenus captiosus (Araneae: Ctenidae). FDACS, Division of Plant Industry, Entomology Circular 319: 1-2. Edwards GB. 1999. Insects of Medical and Veterinary Importance, In Halbert SE. (editor). FDACS, Division of Plant Industry, Tri-Ology (Entomology Section) 38: 8. Edwards GB. 2000. Insects of Medical and Veterinary Importance, in Halbert, S.E., ed., FDACS, Division of Plant Industry, Tri-Ology (Entomology Section) 39: 8. Edwards GB. 2001. Insects of Medical and Veterinary Importance, in Halbert, S.E., ed., FDACS, Division of Plant Industry, Tri-Ology (Entomology Section) 40: 8. Edwards GB. (2002a). Chilean recluse, Loxosceles laeta (Nicolet) (Araneae: Sicariidae) in Florida. Pest Alert. (no longer available online). Edwards GB. (2002b). Venomous Spiders in Florida. Pest Alert. (no longer available online). Gertsch WJ. 1958. 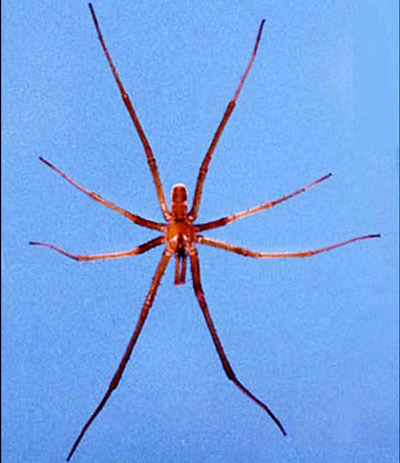 The spider genus Loxosceles in North America, Central America, and the West Indies. American Museum Novitates 1907: 1-46. Gertsch WJ, Ennik F. 1983. The spider genus Loxosceles in North America, Central America, and the West Indies (Araneae, Loxoscelidae). Bulletin, American Museum of Natural History 175: 265-360. Gertsch WJ, Mulaik S. 1940. The spiders of Texas. I. Bulletin, American Museum of Natural History 77: 307-340. Gorham JR. 1968. The brown recluse spider Loxosceles reclusa and necrotic spiderbite - A new public health problem in the United States. Journal of Environmental Health 31, 8 pp. Gorham JR. 1970. The brown recluse. United States Department of Health, Education, and Welfare, Public Health Service Publication 2062. Hite JM., Gladney WJ, Lancaster JL Jr., Whitcomb WH. 1966. Biology of the brown recluse spider. University of Arkansas, Agricultural Experiment Station Bulletin 711: 1-26. Loft K. 2001. DO NOT DISTURB. BayLife, Tampa Tribune, May 22, 2001. Rees R, Shack RB, Withers E, et al. 1981. Management of brown recluse spider bite. Plastic Reconstructive Surgery 68: 768-773. Vetter RS. (2003). Causes of necrotic wounds other than brown recluse spider bites. University of California, Riverside, Entomology Insect Information, Spiders and other Arachnids. (9 October 2018). Vetter RS. 2000. Myth: idiopathic wounds are often due to brown recluse or other spider bites throughout the United States. Western Journal of Medicine 173: 357-358. Vetter RS, Edwards GB, James LF. 2004. Reports of envenomation by brown recluse spiders (Araneae: Sicariidae) outnumber verifications of Loxosceles spiders in Florida. Journal of Medical Entomology 41: 593-597. Vetter RS, Visscher PK. 1998. Bites and stings of medically important venomous arthropods. International Journal of Dermatology 37: 481-496. Weems HV Jr., Whitcomb WH. 1975. The brown recluse spider, Loxosceles reclusa Gertsch and Mulaik (Araneae: Loxoscelidae). FDACS, Division of Plant Industry, Entomology Circular 158: 1-2. Wingo CW. 1960. Poisonous spiders. University of Missouri, Agricultural Experiment Station Bulletin 738: 1-11. Authors: G.B. Edwards, Florida Department of Agriculture and Consumer Services, Division of Plant Industry. Originally published as DPI Entomology Circular 406. Publication Date: August 2003. Latest revision: August 2015. Reviewed October 2018.